The warming Spring has turned Siberian again, with the arrival of the “mini-beast from the east”. 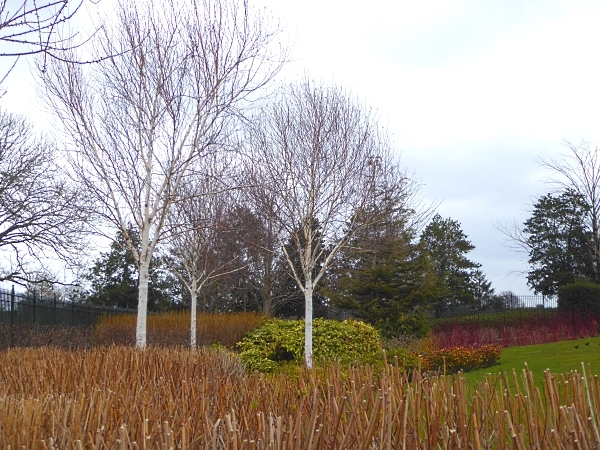 We had light snow overnight, but the pavements were clear this morning, so off we went to Stanley Park. We went into Anfield Cemetery first, greeted mournfully at the gate by a Carrion Crow. 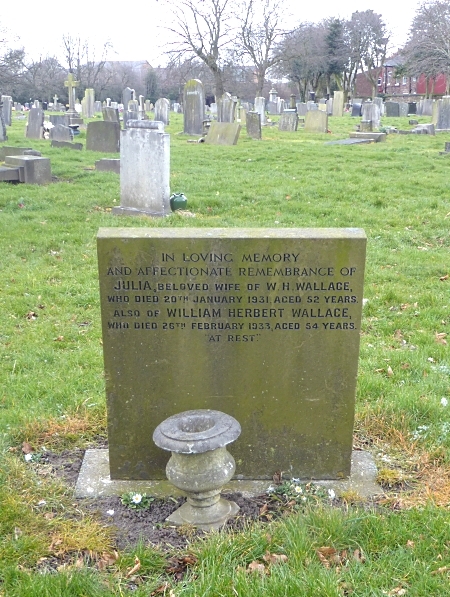 Our goal was the long-sought gravestone of William Herbert Wallace and his murdered wife Julia. This time we found it, near the eastern edge. Julia Wallace’s death in Liverpool in 1931 was for many years regarded internationally as a classic murder mystery. Her husband was convicted of it, then his conviction was overturned on appeal. Many called it the “Impossible Murder”. They are buried together in an otherwise unremarkable spot. The big field had the usual Black-headed Gulls, a Lesser Black-backed Gull, lots of Wood Pigeons and a few Common Gulls. No trees have their leaves out yet, but we were able to identify a Weeping Ash from its classic black winter buds. Near the raised overlook by the old boathouse in the north-east corner is a big Monterey Cypress. There is a circle of venerable London Planes, possibly as old as the park, nearly 150 years. In the centre of the Planes is a different tree which might be a Wych Elm. If so, it’s another of those park planners’ little jokes, hinting at the “magical” or “witchy” nature of the grove. Most of the wildlife was hunkered down in the cold, but we spotted a Robin, several Blackbirds and a single Grey Squirrel. 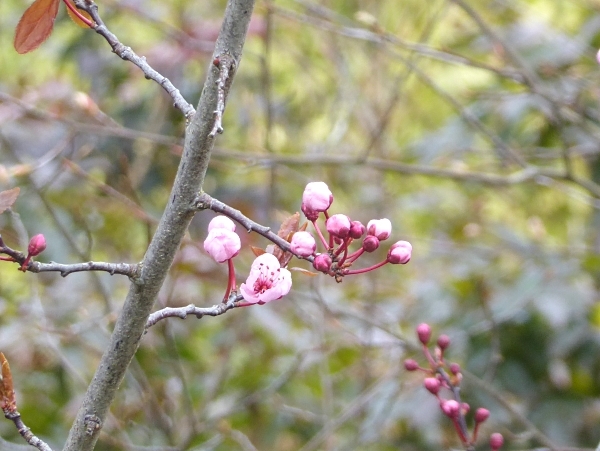 This tree had pink buds, different from the Cherry Plum’s white ones, so was it an Almond? 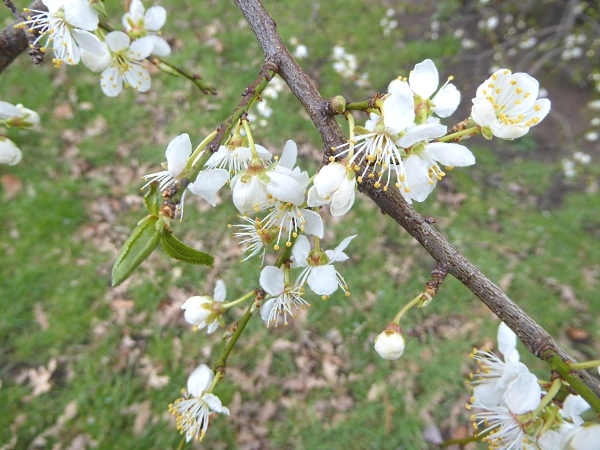 Perhaps not, because Almond buds are supposed to be pointy, not round like these. 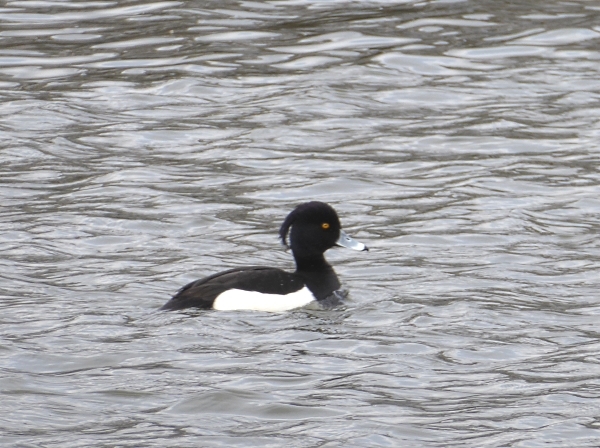 We scanned the lake hoping for a dancing pair of Great Crested Grebes, but there were only Moorhens, Coots on nests, Mallards, Canada Geese, another Lesser Black-backed Gull and a pair of Tufted Duck. The massed daffodils on the Field of Hope weren’t out yet. Despite the occasional sunshine, there were snowy flurries and a bitterly cold wind. We headed for the benches near the Isla Gladstone Conservatory, which gave us a little shelter for lunch. 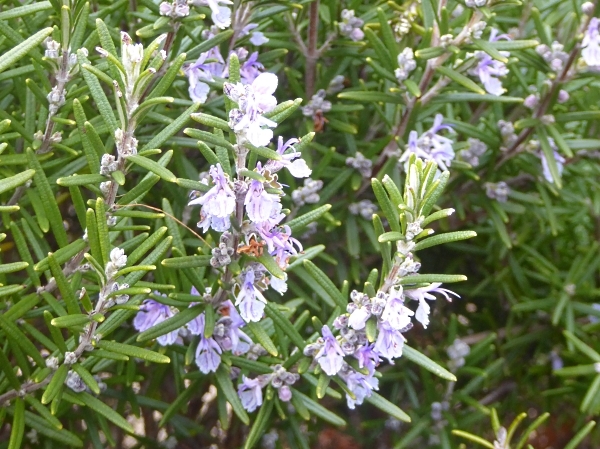 There are three lovely white Himalayan Birches in the shrubbery there (see top picture) and the Rosemary was in bloom. A male Kestrel flew over, setting the little hidden birds a-twitter. 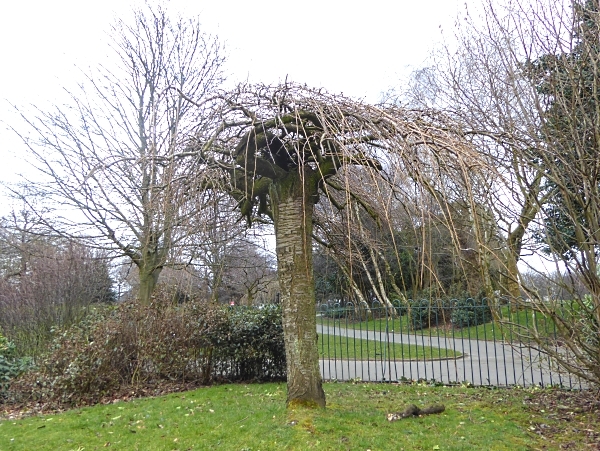 We admired this Weeping Cherry, which is something of a gardener’s artefact, with its branches grafted to the top of a normal Cherry trunk. It will be pretty when it blooms, though. In several places we noted low hedging of some sort of Pine. 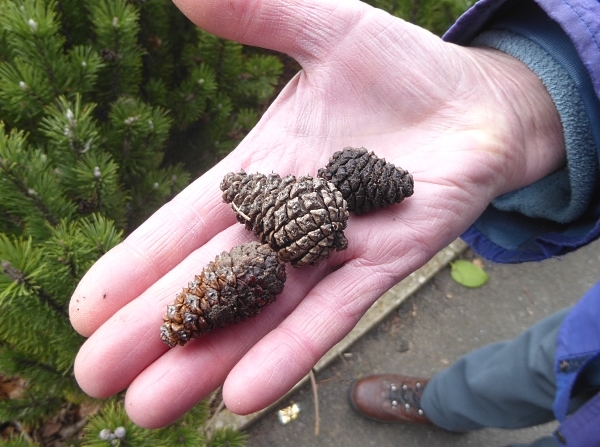 Surely it couldn’t be Scots Pine, growing only two or three feet tall? 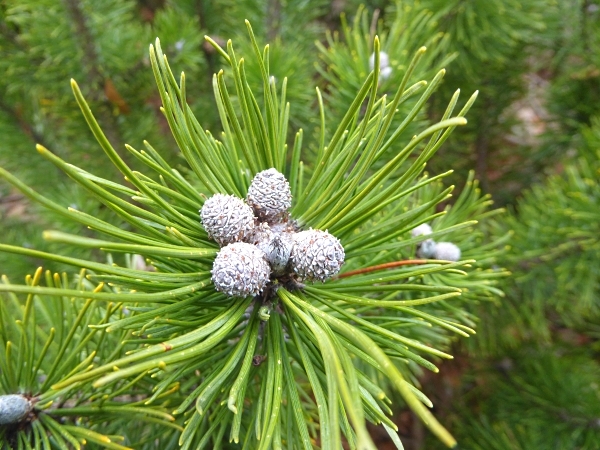 It had all the other signs of Scots Pines though, sets of two needles, a bit twisty, and the cones were pointy. I looked it up at home and I see that there is a dwarf variety called ‘Nana’. That must surely be it. It was far too cold to linger any longer so we all headed home early. Public transport details: Bus 19 from Queen Square at 10.05, arriving Walton Lane / Bodmin Road at 10.20. Some returned on the 68, but I went for the 19 at 13.31 from Walton Lane / opp Newby Street, arriving City Centre at 13.45.